The Montreal center is approximately the area of Jarry Park and 1 mile northwest of Jean Talon Market. Located in the business district, the Best Western Ville Marie Montreal is great for both business and leisure travelers, as it has ample meeting space and guest rooms designed with your comfort in mind. All guest rooms offer pay-per-view movies, complimentary high-speed wireless Internet access, a coffee and tea maker, alarm clock radio, and an iron with ironing board. For recreation, the hotel is home to a fitness center with treadmills, exercise bikes, and free weights. There are also two restaurants on the property. Soaring over President Kennedy Avenue, the Delta Montreal was built in 1986 and offers a luxury experience for your time in Montreal. All guest rooms are furnished with mahogany furnishings, floor-to-ceiling windows, and plush bedding. Many have a private balcony that offers sweeping views of the surrounding area. As a guest of the hotel, you’ll have access to a health club, swimming pool, and business center that has scanning, printing, and faxing services. The hotel is also home to a health spa, dry sauna, and squash courts. Montreal enjoys four distinct seasons, and the city uses each to its advantage. Spring and fall tend to be mild, with pleasant weather and reasonable rates on hotel rooms. Summer is typically the most popular time to visit the city, thanks to warm weather, a walkable city center, and ample festivals. 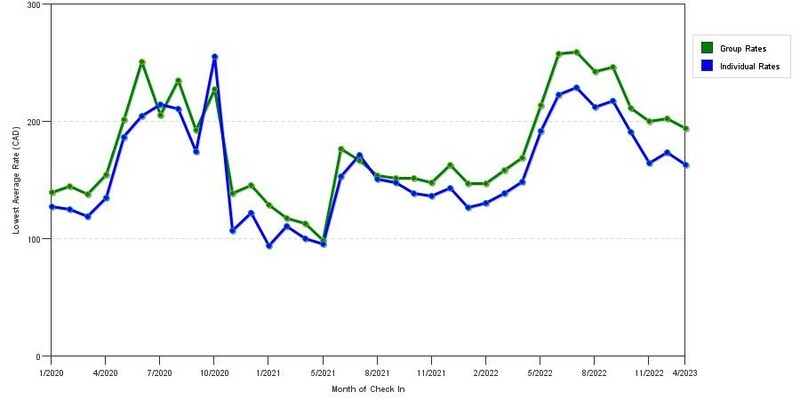 Since it tends to be the most crowded time of year, hotel prices may spike. If you're on a budget and have flexibility in terms of dates, consider scheduling your trip during the winter season. Winters can get very cold in Montreal, but the Underground City passageway extends through much of the city, offering a heated refuge for shoppers and sightseers. Keep in mind that hotel prices also fluctuate throughout the year, depending on festivals and events. If you're looking for an inexpensive time to visit the city, be sure to check the city's calendar for a weekend that's free from festival activities. 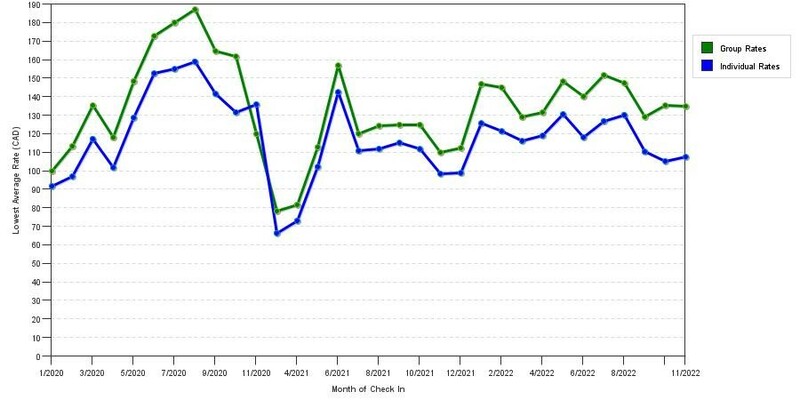 Below are 3 charts demonstrating mean nightly cost trends by star rating class in Montreal, QC. You can use these illustrations to evaluate the most cost effective dates to stay in Montreal for upcoming travels. With its ample old world charm and upscale sense of style, Montreal is home to numerous luxury hotels. Choose from sleek contemporary properties or glamorous historic hotels, and look forward to a truly indulgent stay in Montreal. One of Montreal's most stylish contemporary properties, Holland Hôtel by Simplissimmo, offers four rooms with sleek decor and neutral palettes. The beds with memory foam mattresses provide superior comfort, and the flat-screen TVs help you catch up on the news or unwind with your favorite shows. Relax in the separate sitting area, get up to speed in the workspace, and plan last-minute trip details with the free Wi-Fi connection. With a location that's just steps from Le Cours Mont Royal and the Montreal Museum of Fine Arts, the best of the city is only minutes away from this boutique hotel. Step back in time at Château Vieux-Montréal, located in the heart of the city's downtown core. This castle-like hotel has just two guest rooms featuring beds with Egyptian cotton sheets and kitchens with full-size refrigerators. The hotel also offers wedding services, making this an ideal stay for bridal or wedding parties. Just blocks from Bonsecours Market, Jacques Cartier Square, and the Place d'Armes, the Château Vieux-Montréal offers a location that can't be beat. For a five-star experience in the heart of Montreal, look no further than Hotel Le St-James Montréal. Situated near the Notre Dame Basilica, the Place d'Armes, and the Montreal Museum of Archaeology and History, this luxury hotel is ideal for couples and families. Rooms are spacious, with marble bathrooms and large showers, and Select Comfort beds with Frette Italian sheets ensure a great night's sleep. Stay fit in the health club and sauna, or book an on-site facial or body treatment. Stay connected with free Wi-Fi, and grab a late night bite from the hotel's 24-hour room service. To experience one of Montreal's most desirable luxury properties, stay at the Ritz-Carlton, Montréal. This historic hotel features everything from deluxe rooms to junior suites to royal suites to meet the needs of all guests. All rooms are lavishly appointed, down to the elaborate bathrooms with rainfall showerheads. Treat yourself to room service, or dine next to a garden view at the hotel's restaurant. Take advantage of the hotel's limo service, or explore the city's top attractions on foot. The Montreal Museum of Fine arts, City Centre Montreal, and Christ Church Cathedral are just minutes from the hotel. Montreal might have an upscale vibe, but that doesn't mean you won't find great deals in the city. For the cheapest rates, look for small boutique hotels with basic amenities, and consider sharing a bathroom with other guests to save money. The Hotel Stay Mont Royal has just 11 rooms, and you can choose from a basic standard room with double bed, a room with two single beds, or a triple room. All rooms rely on shared bathrooms, which means all room types are affordable on even the smallest budgets. Start your day with a free continental breakfast, or grab a coffee to go at the coffee shop. Create a spontaneous sightseeing itinerary using the hotel's free Wi-Fi, and store snacks and drinks in the in-room refrigerator. Score a great deal in the Latin Quarter when you stay at Hotel Villa. Room types include economy and standard rooms, and all rooms have shared bathrooms. Stay connected with complimentary Wi-Fi access, or leave your laptop at home and rely on the hotel's computer station. Have a quick breakfast at the hotel in the morning, and enjoy an upscale meal at the neighboring restaurant in the evening. With the Place des Artes and the bohemian Latin Quarter right outside the hotel's door, you'll never be at a loss for things to do. Also located in the Latin Quarter, Hotel Elegant features 44 guest rooms with refrigerators and flat-screen TVs. Choose from standard rooms with one or two beds, and enjoy the free continental breakfast and complimentary Wi-Fi to get even more value out of your budget stay. To save more on Montreal hotels, set your sights on properties outside the city center. On the northwest side of the city, Pensione Popolo has five basic guest rooms that range from standard double rooms with shared bathrooms to an apartment with three bedrooms. Take your meals at the café downstairs, explore the hotel's funky neighborhood on foot, or take a taxi into the heart of Old Montreal. Montreal hotels don't typically offer discounts for seniors or military members, but hotels like the Ritz-Carlton Montréal offer a five to 10 percent discount for AAA members. If you're looking for low rates on Montreal hotels, plan your visit around the city's low seasons, which typically fall in spring and autumn. You might also find discounts on hotel rooms in winter, as long as you don't book during popular events like Igloofest in January or Montréal En Lumière in February. When you're looking for a touch of luxury on a budget, Montreal delivers. The following properties have an upscale look and feel while still offering reasonable rates for business and leisure travelers. Right in the center of Montreal, Renaissance Montreal Downtown Hotel combines a great location with comfortable rooms and reasonable rates. Get a great night's sleep with a pillow-top mattress and down comforter, and wake up under a luxurious rainfall showerhead. Squeeze in a workout at the hotel's fitness center and outdoor pool, and stay in touch with friends or work colleagues using the hotel's free Wi-Fi connection. Business travelers will appreciate the three meeting rooms and business center, and guests of all kinds will like the hotel's restaurant and room service. Located in the heart of Montreal, Fairmont The Queen Elizabeth is just steps from Cathedrale Marie Reine du Monde, Centre Eaton, Le Cours Mont Royal, and many more attractions. The hotel is large, with nearly 1,000 guest rooms, all featuring shower/tub combinations, minibars, and coffeemakers. Start your day right with breakfast in the hotel's restaurant, swim some laps in the indoor pool, and relax with a facial at the on-site spa. With such a great location and a full suite of amenities, the Fairmont offers great value. Situated just north of Old Montreal, Hyatt Regency Montreal is the perfect place for art lovers. The hotel is a short walk from the Museum of Contemporary Art, the Place des Arts, the McCord Museum, and Jean Riopelle Square. Stay in shape in the 24-hour health club or indoor pool, and get the day started with a complimentary breakfast. With comfortable rooms, pillow-top beds, and conveniences like refrigerators and free Wi-Fi, the Hyatt is a great place to stay for a cultural excursion to Montreal. Prices at Le Petit Hotel might climb during busy seasons, but with an ideal Old Montreal location and free breakfast, this hotel offers good value year-round. Enjoy the personal touches at this boutique hotel, including iPod docking stations, free Wi-Fi, designer toiletries, and LCD televisions. Make the most of your trip with the hotel's tour and ticket assistance, or book childcare at Le Petit Hotel and enjoy a night out on the town. Exploring the rest of Montreal is easy, with the city's subway system just steps from the hotel. Whether you love shopping, the arts, or the great outdoors, you'll find something to love in Montreal. Shop and eat your way through Old Montreal and marvel at the fresh produce, cheese, and bread at Jean-Talon Market. See the city's best art at the Montreal Museum of Fine Arts, and gaze at the stunning Notre-Dame Basilica. With the lush Montreal Botanical Gardens and the expansive Parc du Mont-Royal, it's easy to get outside for a breath of fresh air in this Québécois city. From upscale luxury hotels in Old Montreal to budget properties in the Latin Quarter, the City of Festivals has it all. No matter your budget or the purpose of your trip, you'll find the ideal hotel in Montreal. If you think Montreal's name is lovely in all its French depictions, wait till you see Ville de Montreal's cityscape. Quebec's largest city is occupied by a large French populace, but the struggle to speak the lovely language within the city will all be worth it. Canada's Cultural Capital varies itself from its North American neighbors, as it has been named recently as a City of Design by UNESCO. One of the most livable cities in the world, Montreal has successfully redesigned itself into a hub for world affairs, film, culture, design, technology, pharmaceuticals, finance, and even aerospace. Montreal may be a nexus for international associations, but tourists will be delighted by the city's landscape. Guests can cruise along the port, shop along this Parisian-New York hybrid, dine at the Togue with some of the royals, join the Just for Laughs Comedy Festival, or watch the breathtaking Montreal Formula 1 Grand Prix. Finally, dive deep into the Underground City - don't be scared, it's part of the design. "I used to go to Montreal. My mother took me to my first hockey game. City. Good restaurants man. It's a good place, I like it." These simple, yet powerful and heartfelt words of praise and endorsement came from Tom Cruise, a global superstar and a blockbuster phenomenon who does not need to be introduced any further. His endorsement is a mere extension of the love that residents of Montreal, for long or short, seem to share with this city. There are solid reasons for this city to call herself the city of saints, and when all things are said and done, it's the inherent goodwill of the people who live in Montreal is what makes it a truly inspirational and affable city. Bono, Robert de Niro, Martin Scorsese and David Letterman are just more representatives of this strange attraction that Montreal exerts on people from all walks of life. Not only from the tourism point of view, Montreal has a number of attractive facets that tourists who are planning on visiting here need to be aware of so as to be able to explore them. From its beautifully preserved historic sites to artistically designed art galleries and from its giant sporting arenas to adorable public parks, many other things will be waiting to make your trip to Montreal a memorable one! The importance of making your trip economical cannot be overstated. To avid travelers, it need not be told in isolation that the easiest way of cutting your tour budget by a significant fraction is by rejecting yourself the luxury of staying at an expensive hotel, and making do with a cheaper one. Being a major tourism hub in Quebec, Montreal is home to many cheap hotels that can change the prospects of a trip to Montreal from mere plans to solid certainties for many tourists. Le Robervall and Residence la Citadelle are two names that draw the attention of most tourists because of an absolutely spotless profile and positive wealth of reviews they have managed to garner from guests. Hotel Kutuna and Auburge Bonaparte are also similarly comfortable cheap hotels that won't charge you hefty amounts when you finally check-out! Montreal usually likes to be more on the simpler side of life. In spite of all of its skyscrapers and towers, it is a city that enjoys simple life. The spirit of long lost settlers, it would seem, has still lingered on somewhere. But if there are any places that defy this spirit of simplicity, they have to be luxury hotels in Montreal. Hotel Omni Mont-Royal is among the best in this category, noted worldwide for its fabulously stylized interior decor. Sofitel and Ritz-Carlton also operate signature properties in Montreal, bringing their own style and flavor of hospitality to the game. Fairmont the Queen Elizabeth is famous for its all-encompassing kitchen, featuring star chefs from various continents. If this is going to be your very first trip to Montreal, then be assured that you are going to get bowled over by this city of innate natural beauty and the kind of genteelness that we usually associate with people of high stature and polished manners. Montreal is a city that's always lived in dualities of French and English. But credit where it's due “ Montreal has never allowed this duality to set itself back. It has, instead, chosen to use this duality to its extreme advantage, by embracing both the languages and cultures in equal measures. Sticking to the custom, many Montreal hotels also make it a point to appoint employees who can speak both the languages well on their staff. On your first trip to Montreal, your very first sightseeing stop should be the Basilica of Notre Dame. A beautifully pompous building that evokes an aura of piety, composure and positivity is the perfect place to kick start your Montreal experience. Mount Royal (Mont Royale) “ the mountain that gave the city its name “ is also a majestic creature of nature that you should put higher up the hierarchy in your itinerary. Musee de Beaux-Arts (Museum of Fine Arts) at Montreal is a treat to the eyes and sense of art lovers. Jean-Talon Market is the most suitable place to find some locally sourced delicacies after a long day. To kick off another day in Montreal, you can head directly to the Old City of Montreal, where flea markets and street side food joints make you forget all the travails of long hours spend sightseeing. St Joseph's Oratory is nearby the Old City and you can walk down to the oratory in less than 10 minutes. The Oratory features classic Greek architecture fused with modern high-European architecture. You can also choose to visit Montreal Botanical Gardens where eccentric species of plants will be ready to take you by surprise. In addition to all these sights, Montreal houses countless number of museums, galleries, libraries and cathedrals. Montreal-Pierre Elliott Trudeau Int. Airport is the primary airport that services the city of Montreal. Located at a distance of about 16 miles from the city center, this airport happens to be the exclusive hub of entry for international tourists. The distance between the airport and the city is not too large to justify the need for seeking exclusive hotels in Montreal that are nearer to the airport. The state of public transport is quite commendable in Montreal, with buses covering most routes and neighborhoods of the city. Tourists who are inconvenienced by buses can choose to hire private taxi services run by app based companies. A handful of Montreal hotels offer assistance in car rentals and hiring services for a nominal fee over and top of your hotel expenses. Below are reviews of the city of Montreal, QC from an actual visitor's perspective. "Montreal is a great city that is very walkable if the weather permits." It feels like a blend between Europe and North America, with French influences everywhere. The shopping is good and there are also a lot of good cafes and restaurants. The Old Port area is very cool and fun to walk around. Try the smoked meat at Schwartz's. And the bagels. Beautiful city, it has a vibrant creative community. Great city in the spring, trees are in blossom everywhere ! The churches were beautiful and the accommodations were good. The architect and European feel. Plenty of places to see and things to do. Those from out of town who knew Montreal 60 yrs ago had a great tour of the city, and were very impressed. We were in town for Nuit Blanche which was a fabulous and festive weekend. Much needed to get over the winter blahs. Love Montreal, have seen the Habs play. "Bad Traffic but Good Area"
Nice city, but road construction everywhere, expect heavy traffic jam at rush hour. Especially in downtown areas. Lots of places to see, especially liked the casino. The food, the old city, the arts are all here. Many of my group got tickets to ballet and performances right near the hotel. Old world feel was something I didn't know existed in NOAM. The Grey Line City tour really puts things in perspective. Wish the weather cooperated for an old town tour of the city, but we did like the tour we took. Montreal is the French speaking cultural center of Canada with some 250 theater and dance companies, more than 90 festivals and fascinating neighborhoods. Compact and pedestrian friendly, the city is easily navigable by foot or by public transit (bus and metro), both offering safe and clean ways to explore. You'll see that above ground or below, at any time of day or night, getting around the city is secure and simple. It features some of the most exciting food scenes in North America with fine dining as well as wonderful cafés to relax in the afternoon. 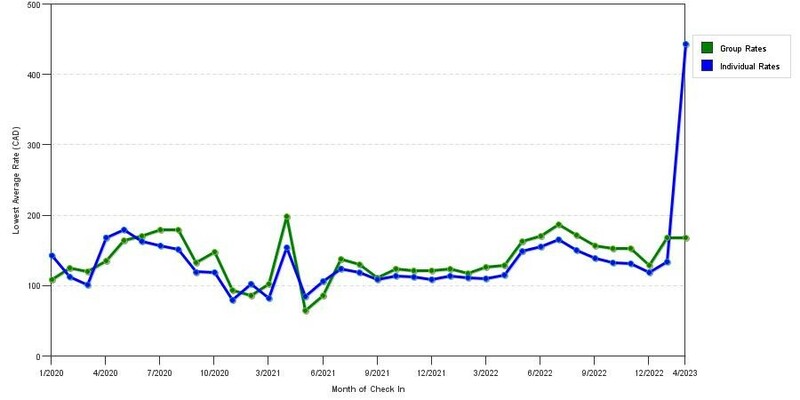 Summer marks peak season and hotel rates increase along with the temperature. Numerous events like the Formula One Grand Prix make booking a hotel room far in advance necessary. Another great time to visit Montreal is March May. 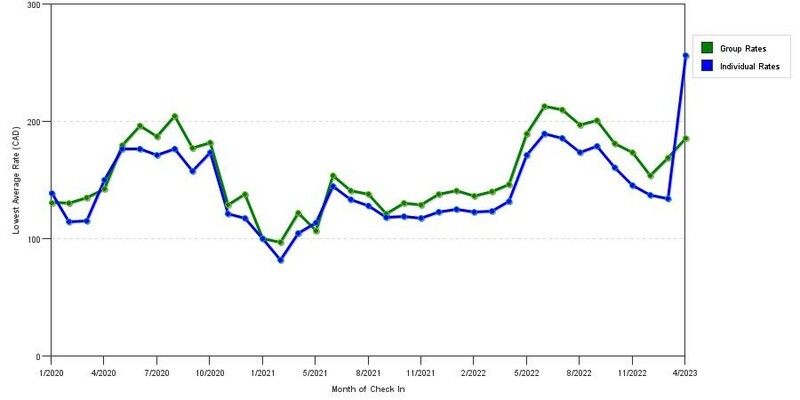 Temperatures start to climb and hotels show higher availability and lower rates. Located downtown and linked to 4,000 hotel rooms by the city's underground pedestrian network, the Palais des congrès de Montréal (Convention centre) features 551,520 sq. ft. of exhibition surface area, making this a perfect meeting space, regardless of climate. The city was traveler friendly, appeared safe and most places are easily accessible. The Eaton center was really nice to visit! Great food, festivals, shopping, sights and people. Great historic district and architecture. Beautiful park (Mount Royal). Many eatery options. It's a different city from Toronto, quite enjoyed their atmosphere, and people. Montreal is the beauty capital of Canada. Coming to Canada without seeing Montreal is like going to the ocean without walking on the beach. Need a group/meeting discount for a hotel in Montreal?